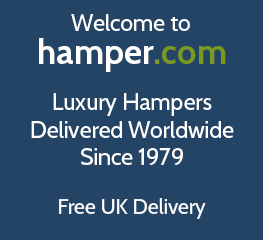 Welcome to Hamper.com, home of luxury Christmas hampers since 1979. Find the perfect Xmas hampers for 2019. With a range of gift sets and presents including Christmas chocolate hampers, Christmas food hampers, Christmas wine hampers and more to send to a friend, relative, clients, staff or anyone special in your life, all of our Christmas hampers in the UK make a great gift idea. Our festive hampers come with free UK delivery, so go on and surprise them with a Christmas hamper online for hamper.com and make their Xmas complete! Our online Christmas gift hampers contain a range of treats and goodies. From a range of savoury snacks and food such as cheese, gourmet pate and smoked salmon (always a good traditional and important part of Christmas day itself) to sweet treats such as traditional Scottish shortbread, luxury Christmas pudding and gourmet Christmas cake, all of our Christmas gift hampers will make the perfect present for a friend, family member or relative, co-worker, clients, staff and other employees or that special someone in your life during the holidays and holiday season. All of our Christmas hampers in the UK can be ordered online, packaged and sent next day free to most destinations within the UK, making these great as a last-minute gift idea or if you’re wondering what to get as a late present. We also offer a free named-day delivery service to destinations within the UK and the rest of the British Isles, so if you’re looking to have your hamper turn up on a specific day, such as a couple of days before Christmas to be ready for when the family are visiting, we can help you get a unique present to share with your family. As the most established hamper company in the UK, we are the largest provider of food and drink based Christmas hampers in the UK, with our online store consisting of a variety of Christmas hampers, gift baskets, gift sets and boxes for men and women, creating the ultimate Christmas gift for him and her ensuring that the recipient can indulge themselves with the wide range of accompaniments in our Xmas gift hampers, such as with accompanying alcohol beverages such as beer, wine, gin, Champagne or Prosecco. We have luxury Christmas hampers and Christmas gifts guaranteed to satisfy everyone. Buy your Hampers online today with hamper.com and get Christmas all wrapped up! If you’re looking for the ideal Christmas present for him or for Xmas hamper ideas for him, why not get one of our Christmas hampers for him? We offer a range of gifts and gift sets filled with a selection of goodies such as cheese and other nibbles like chutneys and crackers to go alongside the cheese as well as sweeter goodies for the man with a sweet tooth. Or if he likes alcohol, we have alcoholic hampers filled with wines or beers, such as a Classic Beer Hamper to make sure he has a very merry Christmas! And if he’s not a fan of alcohol, we also do alcohol-free hampers, which make a great gift or present for the non-drinker! If you want to get a great Xmas gift for her, we offer a wide selection of Christmas hampers for her to get as a present for the festive season. With a selection of great choices, including sweets and chocolate hampers if she prefers confectionery as her main treat, or more savoury snacks if she prefers something like cheese or nuts as a great little nibble. We also do a range of wine hampers including Prosecco hampers to make sure she gets a great present at Christmas time if she loves her wine and other alcoholic drinks. Or if she doesn’t drink, our Alcohol Free Hamper will be a great treat for her to have during the festive times. Our Christmas chocolate hampers and sweet hampers are the ideal Christmas present for male and female friends, children and family members. Our luxury chocolate themed Christmas hampers and gift baskets contain a wide variety of sweet treats and chocolates ideal to celebrate the festive season. Whether you are buying as a gift or just buying it as a present for the whole family to enjoy, we have a selection of sweet treats to please everyone. Check out our range of Christmas chocolate hampers to see our full selection. Port and cheese is highly traditional at Christmas, so why not explore something from our Christmas port and cheese hamper range if you prefer traditional Christmas hampers in the UK. With a range of ports including vintage, ruby and reserve selection port, these are carefully paired alongside a range of cheeses which are curated to work well with the port, including award-winning Cheddar, Stilton and Wensleydale cheese hampers. If you’re looking for a Christmas wine hamper as a great gift for a friend, relative, co-worker or someone else special to you, we do a full range of wine hampers which will make an ideal gift set to give over the Christmas holidays. We do a range of red and white wines as well as rose and Prosecco wines, all of which are carefully complemented by either savoury or sweet treats, meaning that you’ll get a great gift to give during the festive season. So why not explore our range of Christmas wine hampers and see what you can find to give as a present. Our luxury Christmas hampers in the UK and gift baskets can be ordered online and delivered direct to the gift recipients’ door on a free next day delivery to a wide range of destinations in the UK and British Isles. We also have a named day delivery option available for people who want to buy a Christmas gift and send to an individual on a specific day, such as to turn up at a family gathering before Christmas Day itself, which can be selected at checkout. If your friends or family live overseas, buying a gift for them can be quite difficult. This is why we have created a range of Christmas hampers and gift baskets that you can buy online and we will send your hamper gift basket to recipients living abroad through our international delivery to many locations throughout the world complete with personalised gift cards. We provide Christmas hampers and gifts sets to individuals living in Australia, USA, Canada, New Zealand or South Africa so we make sure that your Christmas themed present gets to the recipient in time for the festive season. To view the range of Christmas hampers and gift sets available for international delivery, visit our international delivery page. Food and drink for the family, for friends and for business to open on Christmas day make the festive holiday season a really joyful occasion. This Xmas, why not surprise your lucky recipient with a present full of their favourites foods to go with the classic and traditional gourmet fayre, like pigs in blankets, mince pies and other festive foods consumed with the obligatory Christmas dinner. For other seasons outside Christmas, where hampers are supplied to family members such as mother's day hampers for mum, or father's day hampers for dad, you'll find exactly what you need online at hamper.com.